What a beautiful, independent girl you are. How cute you get so excited that you "dance"
Hi Chloe! Happy Dog of the Day, gorgeous!!! What a sterling representative of your beloved breed you are, Chloe! In looks, personality and heart, inside and out, you exemplify all that is beloved in the Chow Chow! But you definitely are my first dancing Chow! And I like your approach to life, Chloe! No need to keep the humans entertained with tricks and such nonsense, constantly seeking their approval. You've already got them wrapped firmly around your paws! How lucky your human is, having a beautiful, joyful, life loving furkid in you, Chloe, a best friend and devoted companion for life! You truly are a treasure, and so very deserving of your big day of honor! Thanks for the BIG smiles, sweetheart! Meeting you today has been a real treat! I hope you're enjoying a very special Dog of the Day celebration...doing your signature doggie dance, cuddling with your human, being loved and pampered to pieces! Lots of love, big hugs and smooches to you, beautiful Chloe, our very special and most deserving Dog of the Day, EVERY day! Chloe is irresistable, just way to cute for words! Dearest Chloe, you are utterly adorable! What a beautiful, precious Chow Chow you are! Thank you so much for sharing that great photograph with us today, showing that sweet, sweet face looking straight out at me. You have a delightful personality, too, and make your dear persons smile with your energy and antics. I'd love to see you "dancing" when you find something new! You and all your family members love each other very much, don't you. What a wonderful love-filled home you share! 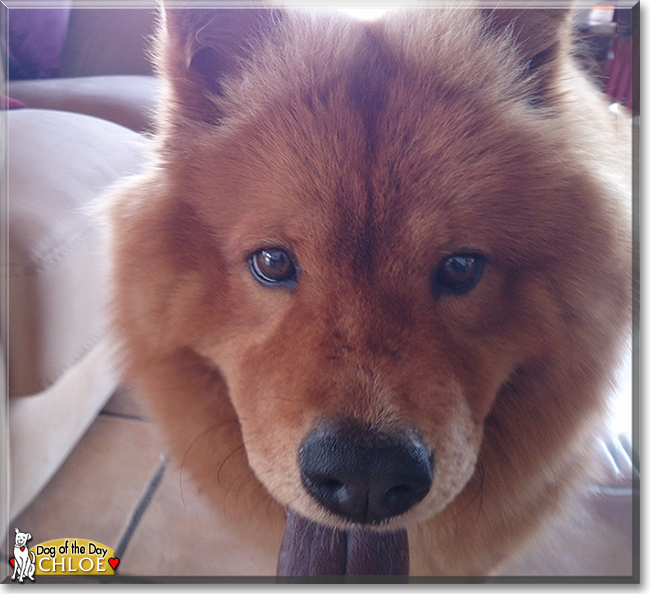 Congratulations, darling Chloe, on being chosen today's Dog of the Day! We hope you and all your family and friends are enjoying a fine celebration, full of fun and lovies and all your favorite games and treats. We are doing the Happy Dance in your honor! Chloe is irresistable, just way too cute for words! Agree, agree, agree! Her brown eyes and her fluffy coat- delightful! Happy Dog of the day, Chloe! Congratulations on being Dog of the Day, beautiful Chloe!